The Penguin Mountain Bike Park is located just 2 km from the township of Penguin on the North west Coast of Tasmania. The park features more than 6km of XC single trail and mouth watering man made features in the centre of the old speedway featuring jumps, wall rides and a smaller skills park. The park is suitable for riders of all levels and is an ideal area to progress from a fresh beginner to a more seasoned rider. The Penguin Mountain Bike park is also a good starting point for longer and more challenging rides in to the Dial Range at the Southern end of the park. Please check with Tasmanian Parks and Wildlife for the most up to date information on where you can ride in the Dial. From the Bass Highway take an exit to Penguin and head South, away from the township follow the signs to the Penguin Regional Sports Centre and in to Ironcliffe Road. 100m from Sports Complex Road on the left, there is a small parking area and yellow boom gate where limited parking is available. You can connect on to most of the trails from here which will take you to the main clubhouse and skills park area. There are a number of directional signs around the park that should help you to navigate. Event parking is usually available within the park, take the second yellow boom gate on your left and follow the road into the gravel parking area. Please use extreme caution when driving this road as it forms part of the trail network and therefore you may come across riders. Keep your speed under 10 km/h. 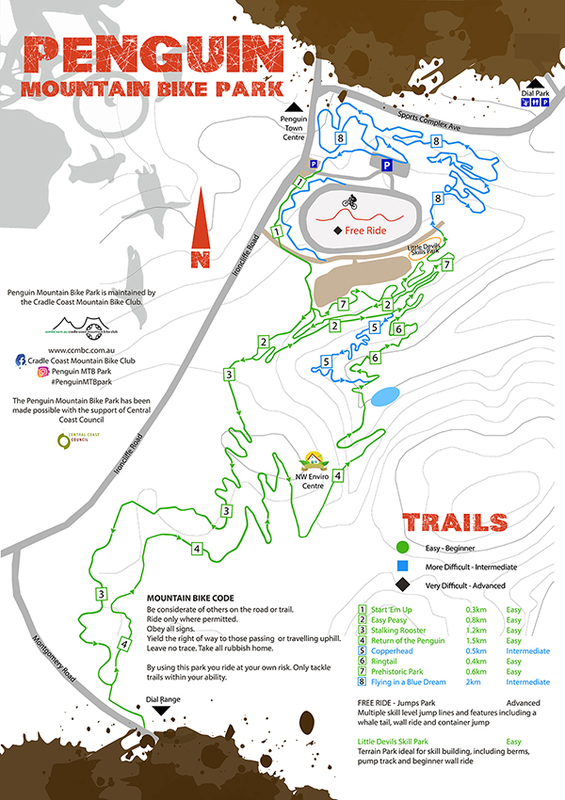 Download the Penguin MTB Park Map here. Construction is underway on a three-stage plan to build 60 kilometres of trail in the Dial Range. The first stage of the project funded via State and local Government grants and club funding, is due to open by the end of 2018. North West Tasmania has three specific locations to ride. As is often the case, some of the trails across the North West are shared use. Please respect other users within these areas and slow down and give way to walkers. There are also a number of excellent trails in and around Launceston, including Kate Reed, Trevallyn and Hollybank. Blue Derby Mountain Bike Trails are about 2.5 hours from Devonport.